Are you looking for Discount Tickets to the Boston Tea Party Ships & Museums? 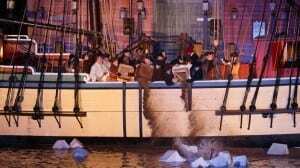 If you would like to re-enact a big piece of American history, you may want to stop by the Boston Tea Party Ships & Museums. Regular price tickets to the museum is $29.95 for adults and $18 for children 5-12. Seniors, military members and students can save $3 on admission with proper ID. If you are looking to buy directly through the source, you can save up to $1.50 when you buy your tickets online ahead of time with no additional taxes or fees. You can also find discount tickets to the ships & museum through Goldstar Boston for $19 (with a $3.75 service fee) for tours through October 31, 2018. Sometimes LivingSocial and Groupon has discount offers as well, but they don’t currently have any deals, but keep an eye out for those! Also, let me know in the comments below if I missed any discounts! For more information about discount tickets through Goldstar Boston, please head here. For more discounts and coupons for various attractions in and around Boston, please head here. *This post contains affiliate links, please see my disclosure policy if you have any questions.